[prodDesc] => You can never have too much chocolate, can you? This set includes 4 scrumptious chocolate bars in 4 varieties. The set includes a Milk Toffee Sea Salt, a Milk Chocolate Peanut Butter, a Dark Chocolate Sea Salt Caramel, and finally a White cookies and Cream chocolate bar. This is chocoholic's dream come true. [prodDesc] => Rich, aromatic and with a sweet flavor containing just the right amount of acidity. A vinegar you can use every day to lift salads, marinades and sauces, or add zing to strawberries. [prodDesc] => White winter truffles are esteemed by many to be the best variety of truffle. This rich, aromatic truffle has been naturally infused into our high quality olive oil for a unique truffle taste you can enjoy anytime and with almost any dish. This oil will enhance all truffle dishes or can be used directly in place of real, fresh, white truffles and is highly recommended for its quality by chefs and gourmet lovers around the world. [prodDesc] => This velvety and luxurious oil is made with the aroma of the highest quality black truffles and is a perfect match for bringing all your Foods to the next level of gourmet. When infused into a traditional olive oil from Tuscany, the essence of these truffles is captured in a perfect symbiosis ideally suited to enhance the taste of main dishes, appetizers and garnishes. 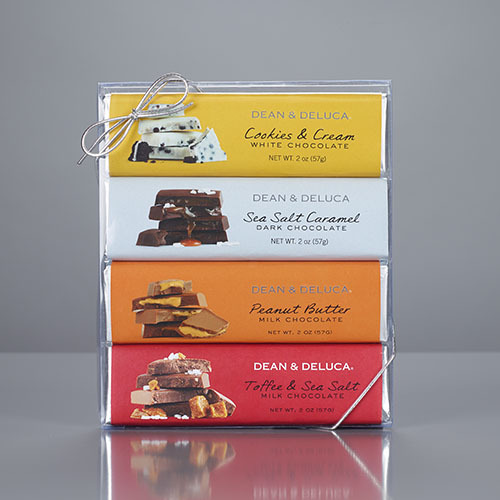 [prodDesc] => ONLY AT DEAN & DELUCA. Our extra virgin olive oil is pressed from the finest Sicilian Nocarella del Bellice, Biancolilla and Cerasuola olives. With its deep, brilliant green color and aromatic notes of herbs, citrus, green tomato and artichoke, it's a treat for both the eyes and the palate, and its finish is both pleasantly bitter and persistently spicy. You can never have too much chocolate, can you? This set includes 4 scrumptious chocolate bars in 4 varieties. The set includes a Milk Toffee Sea Salt, a Milk Chocolate Peanut Butter, a Dark Chocolate Sea Salt Caramel, and finally a White cookies and Cream chocolate bar. This is chocoholic's dream come true.